At a Toastmasters Club, you end up learning things that you didn’t know before you came to the club, not just about the art of public speaking, but the various subjects that people present in their speeches. At our Project Masters Orange County Club, which was founded by the Project Management Institute of Orange County, California, we had many speeches given by project managers about the subject of project management, and I definitely learned many things at that club about the subject. However, the most dramatic presentation in my mind was that given by a fellow Toastmaster Van Wray about an event now long past but still important in California history, namely, the St. Francis Dam Disaster of 1928. The reason for the failure of the dam was analyzed at the time as being due to an inadequate geological survey, but more recent analysis by civil engineers and historians point to a culprit that is more familiar to project managers, namely, that of scope creep, which is adding of work to a project without accounting for its effect on the project as a whole. This mistake can have serious consequences for a project, but in the case of the St. Francis Dam, the results were catastrophic and led to the deaths of up to 600 people. The St. Francis Dam was a concrete curved gravity dam built about 40 miles northwest of Los Angeles in the San Francisquito Canyon. It was designed and built between 1924 and 1926 by the Los Angeles Department of Water and Power under the supervision of the legendary engineer William Mulholland. Here is a picture of the dam looking north, with water in its reservoir, in 1926. 2. What was the scope creep involved? On the morning of March 12, 1928, the dam keeper discovered a leak in the dam, and he notified Mulholland immediately. The muddy color of the runoff from the dam indicated that the water might not just be coming from a crack in the structure, but might be eroding the very foundation of the dam itself. Mulholland came and inspected the dam, but proclaimed that the leak was “not dangerous” and left. At two and a half minutes before midnight on March 12th, the dam burst and 12.4 billion gallons of water surged at 18 miles an hour down in the canyon in a wave that was 120 feet high. By the time it had emptied into the Pacific Ocean 5 1/2 hours later, it had became a raging torrent 2 miles wide and bodies were found scattered as far as the Mexican border. 4. What were the proximate causes of the dam collapse? According to Dr. J. David Rogers, Chair in Geological Engineering at the University of Missouri-Rolla, the base of the dam was lifted upwards by a phenomenon called “hydraulic lift.” The center of the dam was the only section left standing when it collapsed, because it was the only section that contained uplift relief walls at the base. The eastern section was the first to collapse, which undercut the central section and caused it to tilt and rotate towards the western portion. When this final portion collapsed, the dam finally burst and the flood waters were then released. 5. What were the consequences for Mulholland? Although the investigation done at the time pointed to deficiencies in the geological survey of the foundation as the cause of the problem, rather than on the engineering design done by Mulholland. Nevertheless, Mulholland took full responsibility for the disaster, and it ended his career. 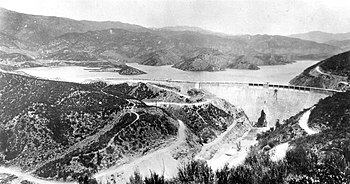 The more modern re-investigations of the incident showed that the geological instability of the area on which the dam was built was indeed a factor, but the failure to compensate for the additional height of the dam in the rest of the design, plus the fact that the design was overseen by only Mulholland himself were the factors which were the real crux of the problem. The phenomenon of “hydraulic lift” was actually starting to become known in the civil engineering community in the 1910s and 20s, and if Mulholland had researched the design more diligently, the dangers of the changes to his design might have become more apparent. This failure to compensate for the two additional height changes is the essence of scope creep, which is why the first step in whether to accept a change to the scope should be to analyze the impacts of that change on the other parameters and constraints of the project, or in this case, the design. The analysis should be done by as many members of the team member as have expertise in the area, with additional expertise being sought by subject matter experts outside the team as necessary. Mulholland’s failure to take these steps not only ended his career, but the lives of up to 600 people, and caused the 2nd largest civil disaster in California history. So if you wonder why we project managers take scope creep seriously, just remember the St. Francis Dam Disaster of 1928! Note on sources: the main source for this post was the March-April 2010 issue of the Santa Clarita Valley Historical Society newsletter. For more details, see http://www.scvhs.org/news/dispatch36-2.pdf.